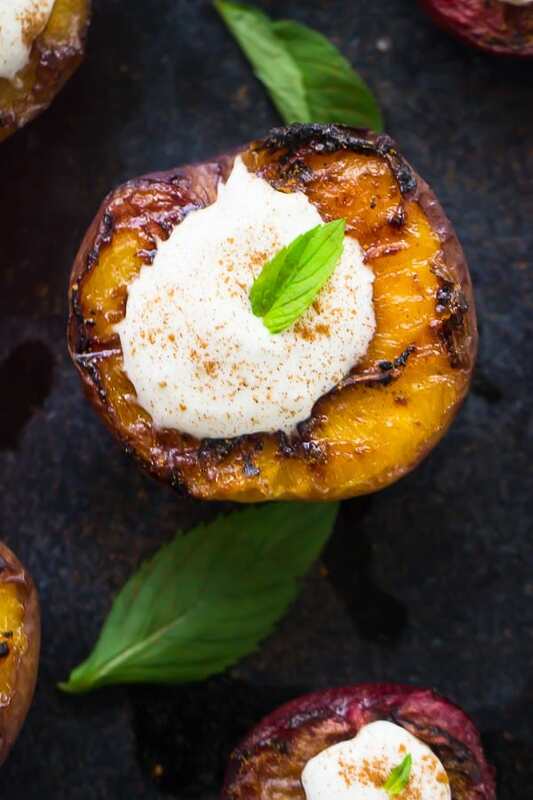 This Grilled Stone Fruit makes a delicious, fresh and healthy summer dessert! 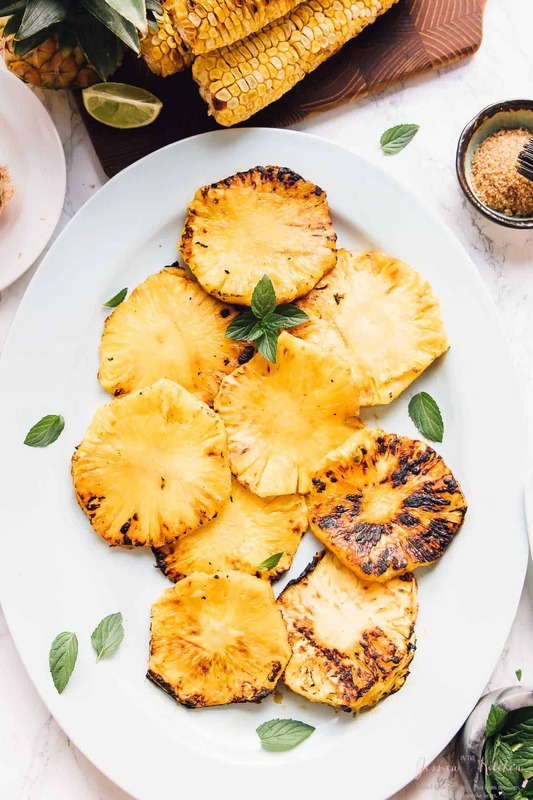 It’s served with a sweet homemade coconut cream in just 15 minutes! I’m currently on vacation in London! I’ll try to respond to your comments and messages but there may be a delay! Fact: this is the first summer that I’ve really ever tasted a peach. I don’t mean that I never tried it before, but it’s always been in something, kind of disguised. I finally took a peach straight out of the fridge and took a bite out of it. Why didn’t I realise just how amazing these were by themselves? 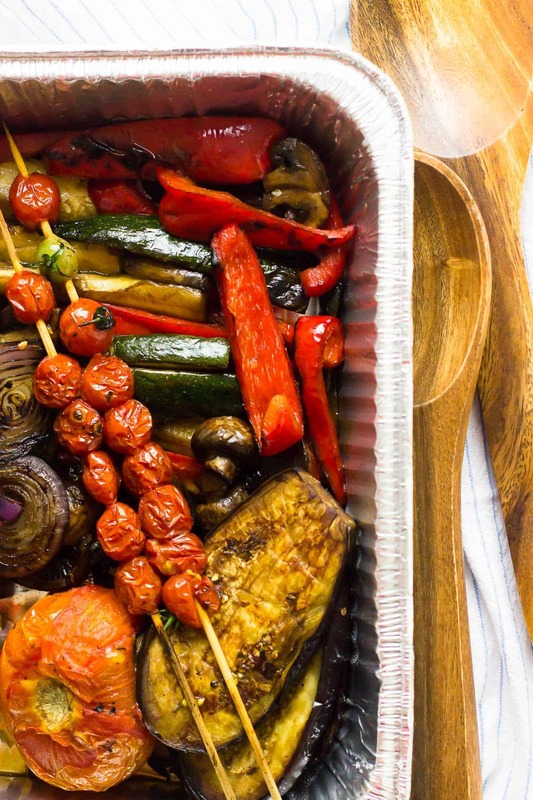 After this discovery, I did what I always do to fruits I love – try it cooked or roasted. What. a. delightful. transformation. Then I tried plums too and I’d like to declare that grilled stone fruit is the best thing ever. Topped with coconut cream and this became my nightly dessert for a week straight. I’m really going to miss summer fruits there is nothing quite like the refreshing tasted of a fresh picked peach. You may have noticed that I LOVE bright, bright colours on my blog especially in food, and you don’t even have to try hard when it comes to summer fruits. They’re all so bright, beautifully, juicy and welcoming. Hence my obsession with watermelon and cantaloupes for example. I do love fall veggies and fruits (hello all things pumpkin!) but I’ll be eating summer fruits as long as I possibly can. Grilling this stone fruit was one of my better life decisions. They go from delicious and tasty to soft, filled with aroma and flavour and irresistible. It’s kind of hard to describe, so promise me you’ll just go ahead and make them! They are so easy to make, and take just a few minutes on the grill. They work so well for all things summer celebrations as well as for upcoming Labor Day. Definitely a must make. The coconut cream on top was just that – the cherry on top. It was lightly sweetened, thick and fluffy and the contrast with cold and warm worked so well. The coconut cream is so easy to make and takes barely any prep work. Just ensure that the coconut milk container you have is 100% full fat coconut milk. We accidentally bought a different brand only to find out that it had “coconut extract”, water and xantham gum. So, yes friends, triple check. P.S. (is this now a thing in my blog posts?!) These taste ridiculously delicious on a pizza. Save some for that deliciousness. Enjoy! Turn the coconut milk tin upside down, and open. You should see a little liquid on top but the rest should be very hard like a thick cream. Pour out the liquid separately and put the thick cream into a cold mixing bowl. Whip until thick and creamy (about 30 seconds to 1 minute straight), adding in the sugar to sweeten to your preference. If you don't want it to be sweetened then feel free to leave it out! 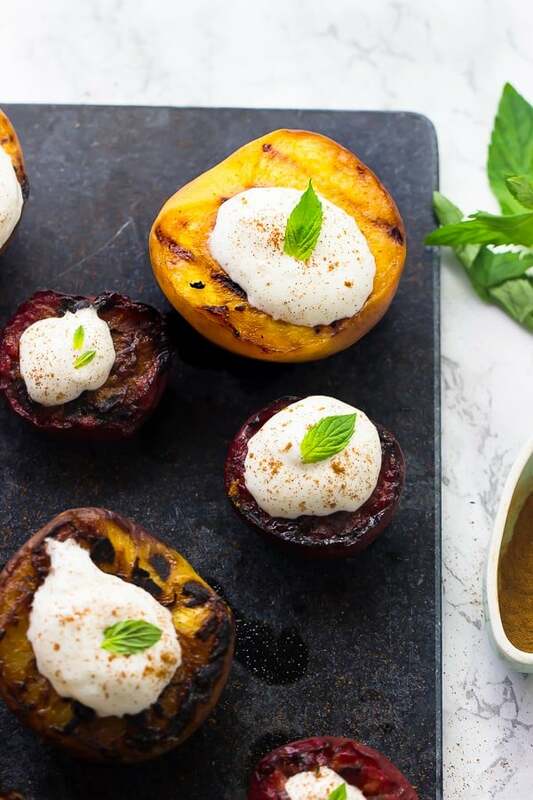 Brush the peaches and plums with the coconut oil before putting on the grill. Have a tray nearby to remove. 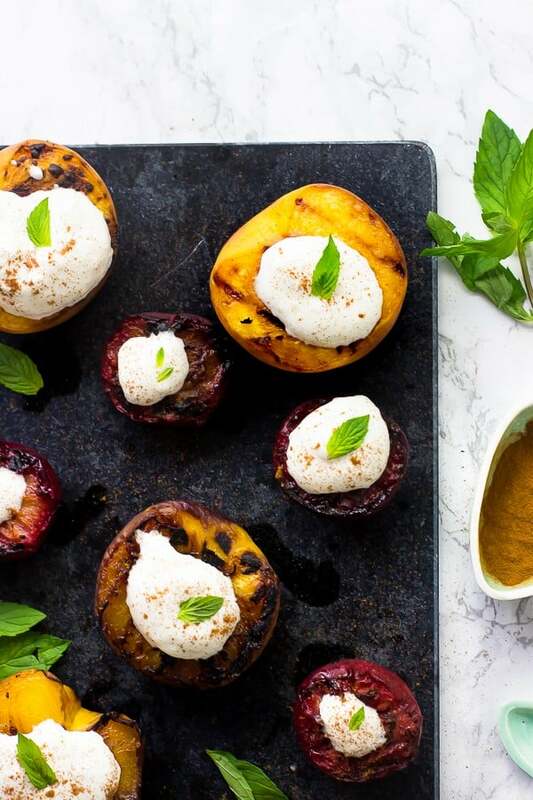 Place each half down on the grill and cover, grilling for up to 4-6 minutes and until the stone fruit have softened and grill marks are present. Check to ensure they don't burn. You can rotate 90 degrees to get criss cross on the stone fruit. Remove onto a plate. Dollop coconut cream on top, sprinkling with cinnamon. You can also brush with maple syrup when they come off the grill, or even top with vegan ice cream! Enjoy! 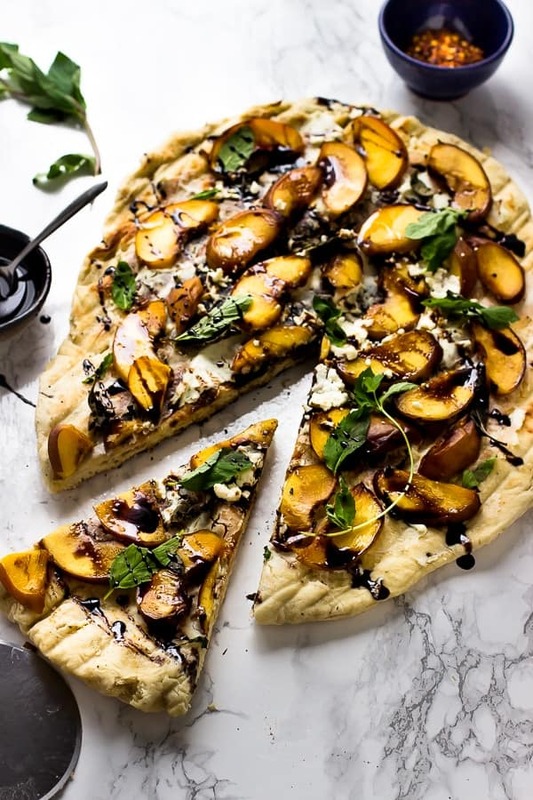 You can use apricots and nectarines if you’d prefer, any stone fruit works in this recipe! 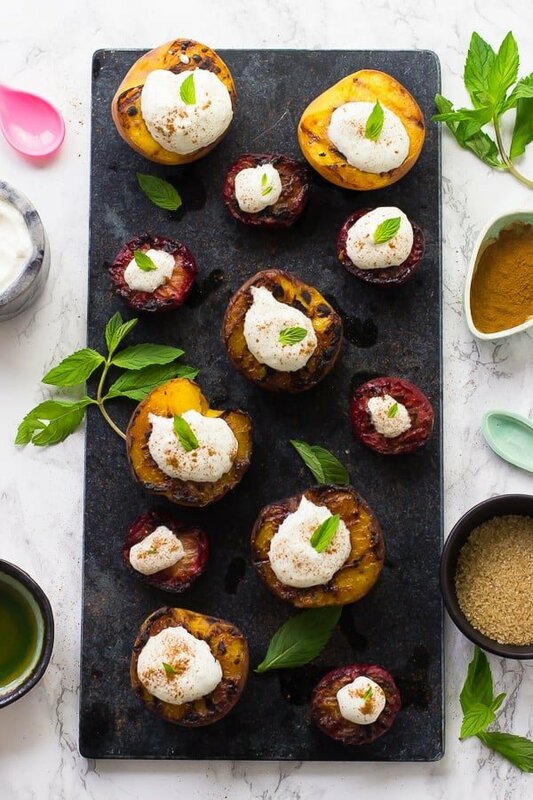 If you try these Grilled Stone Fruit with Coconut Cream please let me know in the comment section below, or tag me on instagram with the hashtag #jessicainthekitchen! For more exclusive recipes follow me on Instagram AND on Snapchat: jessinkitchen.